4. Department of Pathology, Samsung Medical Center, Sungkyunkwan University School of Medicine, Seoul, Korea. Comprehensive characterization of individual patients' tumour is important to realize personalized medicine. Here, we investigate to identify subsets that benefit from capecitabine plus RAD001 in advanced gastric cancer (GC) patients by comprehensive high-throughput genomic analysis (nCounter assay). Archival tumour tissue blocks, if possible, were collected at phase II trial of capecitabine plus RAD001 in 47 refractory GC patients (at clinicaltrials.gov NCT#01099527). A total of 42 formalin-fixed, paraffin-embedded (FFPE) tumour samples were available for nanostring based-multigene Assay. An nCounter assay of 519 kinase panels has been used. We performed correlation analyses between expression levels of kinase genes and response for capecitabine plus RAD001. Among 42 patients with An nCounter assay of 519 kinase panels, 4 patients achieved confirmed partial response and 15 patients revealed stable disease, resulting in an overall response rate (ORR) of 9.5%. No difference in ORR was observed in terms of gender, performance status, primary tumour site, gastric resection, histologic subtype, Lauren classification, No. of metastatic site and No. of chemotherapy. In subgroups with response for capecitabine plus RAD001, there is significant overexpression of 6 genes among 519 kinase gene such as EPHA2 (P = 0.0025), PIM1 (P = 0.0031), KSR1 (P = 0.0033), and EIF2AK4 (P = 0.0046) that are related to the activation of mTOR signalling. This study is first report that investigated to identify biomarkers predictive of the response for RAD001 containing treatment in refractory GC patients, by comprehensive high-throughput genomic analysis (nCounter assay). Gastric cancer (GC) is still the fourth most common cancer and the second most common cause of annual cancer related deaths worldwide [1, 2]. For patients with recurrent or metastatic gastric cancer, chemotherapy is the standard care, but the response rate is still below 50% and the duration of response is as short as a few months . Salvage chemotherapy in patients who have failed one cytotoxic chemotherapy was recently proven to be efficacious in gastric cancer by our group. Nevertheless, the median overall survival for docetaxel was 5.2 months and irinotecan was 6.5 months . Hence, salvage treatment needs to be aggressively investigated in GC patients, especially those who have failed first-line chemotherapy. Phphatidylinositol 3 kinase (PI3K)/Akt and mammalian target of rapamycin (mTOR) are activated in 30% and 60% of human gastric carcinoma, respectively [5, 6]. mTOR, a serine/threonine kinase, is thought to play a central role in regulating cell growth, proliferation, cellular metabolism and angiogenesis . Inhibition of the mTOR signaling as a new therapeutic target is an active area of research. Currently, everolimus (RAD001) is the only oral mTOR imhibitor that has been investigated in phase I/II /III clinical trials of patients with advanced GC [8-11]. Furthermore, based on preclinical studies showing synergistic effects with some cytotoxic agents including 5-fluorouracil (5-FU), some clinical studies have been evaluating RAD001 in patients with GC in combination with chemotherapeutic agents [12-14]. Our group also conducted phase II trial of capecitabine plus RAD001 in refractory GC patients . Irrespective of whether these trials used RAD001 met their primary end points, these commonly showed that treatment including RAD001 had the effectiveness in small subset of GC patients who were pretreated. Thus, identification of specific biomarkers for heterogeneous patient subpopulation with advanced GC may help define those patients who would receive the most benefit from RAD001 treatment. However, despite many efforts, biomarkers predictive of therapeutic success for RAD001 have not been determined in GC patients. Comprehensive characterization of individual patient's tumor is needed for realization of personalized strategies for each patient. We chose to use nCounter platform (Nanostring Technologies, Seattle, WA) due to its ability to interrogate expression levels of up to 800 genes using total RNA extracted from FFPET in a single tube reaction . One of the pre-built multigene kinase assay surveys known cancer kinase genes. Recently, we confirmed that there was high concordance in assessment of triple markers (EGFR, HER2, and MET) in AGC between IHC test and nCounter assay with high sensitivity and high specificity. We investigated to identify subsets that benefit from capecitabine plus RAD001 in advanced gastric cancer (GC) patients with nCounter assay as reliable high-throughput genomic analyser. Between March 2010 and June 2012, a phase II trial for capecitabine plus RAD001 in AGC patients had been conducted in our institute, Samsung Medical Center, Seoul, Korea (clinicaltrials.gov NCT#01099527) . GC tissues were collected from 42 of all 47 patients enrolled in the above clinical trial. The process for acquisition of tissue was approved by the institutional review board of the Samsung Medical Center. All study participants provided written informed consent form recommended by the IRB. For all cases, we reviewed the data for age at diagnosis, gender, ECOG (Eastern Cooperative Oncology Group) performance status, primary site of GC, prior gastric resection, histologic subtype, Lauren classification, numbers of involved organ, metastatic site, and prior chemotherapy. All H&E stained slides were reviewed and representative areas were carefully selected and marked on all paraffin blocks. Nanostring-Based Multigene Assay was applied to 42 of 47 patients enrolled in a phase II trial for capecitabine plus RAD001. Total RNA was extracted from 1-2 sections of 4-μm thick formalin-fixed, paraffin-embedded (FFPE) tumour sections from representative tumor blocks using the High Pure RNA Paraffin kit (Roche Diagnostic, Mannheim, Germany) after removing non-tumor elements by manual macrodissection guided by hematoxylin and eosin stained slides. For Nanostring-Based Multigene Assay (nCounter assay), 100 ng of total RNA was hybridized with the custom designed code set of 519 genes for 18 hours at 65°C and processed according to manufacturer's instruction . Standard descriptive and analytical methods were used to describe the patients' characteristics, and clinical outcomes. The tumor response was classified on the basis of Response Evaluation Criteria in Solid Tumors (RECIST) criteria, version 1.0 guidelines. The association of treatment response with various clinic-pathologic features was analyzed using the chi-square test and Fisher's exact test. In order to identify differentially expressed genes related to the response for capecitabine plus RAD001, we performed t-tests with 10,000 per mutations. 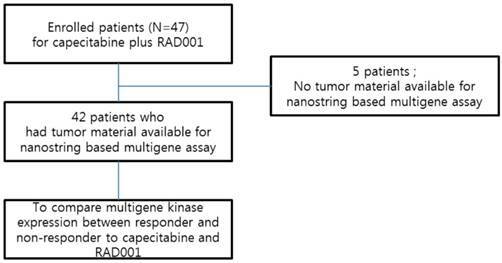 In this study, we analysed 42 with tumour sample available for nanostring based-multigene Assay among 47 AGC patients enrolled in a phase II trial for capecitabine plus RAD001 as salvage therapy between March 2010 and June 2012 (Figure 1). As are summarized in Table 1, patients composed of 31 (73.8%) male and 11 (26.2%) female with median age 52 years (range 37-78). Most of the patients (97.6%) had a good performance status (ECOG 0 or 1) and over half of patients (64.3%) had gastric resection. Most patients (81%) had 2 or more metastatic lesion and 90.5% received 3 or more palliative chemotherapy including capecitabine pus RAD001. Clinicopathological characteristics of patients with advanced gastric cancer (GC) in this study. Among 42 patients available for an nCounter assay, 4 patients achieved confirmed partial response and 15 patients revealed stable disease, resulting in an overall response rate (ORR) of 9.5% (Table 2). Disease control rate was 45.2%. Three patients were not available for response evaluation. No difference in ORR was observed in terms of gender, performance status, primary tumour site, gastric resection, histologic subtype, Lauren classification, No. of metastatic site and No. of chemotherapy (Table 3). We evaluated the expression-nature of kinase genes by Nanostring-Based Multigene Assay in 42 patients. Among expression nature of 519 kinase genes, overexpressed kinase genes related to the response for capecitabine plus RAD001 were sorted while changing the weight of P-value such as 0.05, 0.01, and 0,005. 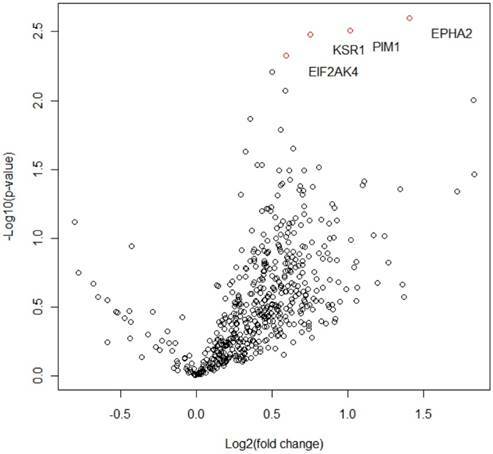 When the cut-off of P-value for the significance is 0.005 (Table 4), there is significant overexpression of 4 genes among 519 kinase gene such as EPHA2 (P = 0.0025), PIM1 (P = 0.0031), KSR1 (P = 0.0033), and EIF2AK4 (P = 0.0046) that are related to the activation of mTOR-signaling (Figure 2). The efficacy for capecitabine plus RAD001 according to clinicopathological characteristics of patients. Profiles for kinase gene overexpression associated with the effect of capecitabine plus RAD001. Among 519 kinase genes, 4 significant differentially expressed genes whose P -value < 0.005 and their fold changes are shown in Volcano plot. The present study represents the first comprehensive high-throughput genomic analysis to identify biomarkers predictive of the response for RAD001 containing treatment in refractory GC patients. Based on our genomic analysis, there is significant overexpression of 4 genes such as EPHA2 (P = 0.0025), PIM1 (P = 0.0031), KSR1 (P = 0.0033), and EIF2AK4 (P = 0.0046) related to the response for capecitabine plus RAD001. These finding may help define subsets who would receive the most benefit from RAD001 treatment. mTOR is a central regulatory kinase that increases the production of proteins that stimulate key cellular processes such as cell growth and proliferation, cell metabolism, and angiogenesis [16-18]. The mTOR pathway has been shown to be frequently dysregulated in a variety of human cancers, including gastric cancer . Patient-derived gastric cancer samples have been shown to express phosphorylated mTOR indicative of mTOR activation, which has been positively correlated with tumor progression and poor survival in GC patients [6, 20-23]. Our study showed there is significant overexpression of 4 genes such as EPHA2 (P = 0.0025), PIM1 (P = 0.0031), KSR1 (P = 0.0033), and EIF2AK4 (P = 0.0046) related to the response for capecitabine plus RAD001. Interestingly, the overexpression of these genes has been known to associate with the activation of mTOR-signaling (Table 5). Overexpression and mutation of EPHA2 were known to be associated with mTOR phosphorylation in lung cancer . PIM1 was also reported in promoting mTOR activity leading to increased phosphorylation of two effector molecules, S6kinase 1 (S6K1) and 4E-binding protein 1 (4EBP1) by Kathleen et al, Zhang et al [25, 26]. KSR1, a scaffold protein for Raf, MEK and ERK plays a critical role in the optimal activation of ERK . Furthermore, KSR1 is known to associate with mTOR. Thus, KSR1 regulates mTOR activation, both by controlling ERK activation and by bringing together members of ERK and the mTOR pathway [28-30]. Lastly, it has been known that ELF2AK helps S6K1 activated by mTOR to promote mRNA translation [31, 32]. Along these lines, four genes such as EPHA2, PIM1, KSR1, and EIF2AK4 have been known to be associated with the activation of mTOR signalling, directly or indirectly. Therefore, it is theoretically proper that patients with overexpression of these kinase genes benefit from RAD001-containing therapy in our study. As far as we know, this is first-study that reports the overexpression of EPHA2, PIM1, KSR1, and EIF2AK4 related to the activation of mTOR signalling in GC. These findings reconfirm that molecular targeted agent can be effective in only selected patients with the dependence on signal-pathway related to target-molecule. Potential predictors and activation of mTOR signaling. Among expression nature of 519 kinase genes, overexpressed kinase genes related to the response for capecitabine plus RAD001 were sorted while changing the weight of p-value such as 0.05, 0.01, and 0,005. In P < 0.05, overexpressed 32 kinase genes (EPHA2, PIM1, KSR1, EIF2AK4, SGK223, STK38, PNCK, CSNK2A2, TLK1, MAPK14, SGK3, ADCK2, MTOR, MAP4K3, TAF1L, NLK, PRKG1, EPHA7, SRPK2, MAPK11, MAPKAPK5, PRKY, STK35, PAK4, SGK494, PRKAA2, SIK2) and of 519 were selected and, in P < 0.01, 7 kinase (EPHA2, PIM1, KSR1, EIF2AK4, SGK223, STK38 and PNCK) genes selected. However, sample size of this study was too small, and the stricter p-value (P < 0.005) was needed for increasing the statistical significance and power. For the overexpression of mTOR, there was significant relation to successful response for RAD001 in p-value <0.01, but not in P < 0.005. Signal transduction through mTOR pathway is processed by both mTOR itself and various biologic network of upstream and downstream . The intensity of signalling through mTOR pathway may be more affected by other kinase workings related to the pathway rather than overexpression of mTOR, itself. Furthermore, in addition to overexpressed kinase genes, other types of genetic alterations such as fusion and mutations might affect the activation or downregulation to signalling through mTOR pathway. Thus, due to the complexity of mechanisms underlying mTOR pathway activation, comprehensive genomic analysis of tumour is needed. Gene expression based pathway readout may be more appropriate than relying on a single indicator of pathway activity, as alterations in multiple signalling components could lead to pathway activation and result in similar downstream effects. Recent studies showed the potential for gene signature derived from platforms to be predictive of clinical drug response [34-36]. We plan to develop the signature based-platform to predict the response for RAD001 and validate it in our patients' derived gastric cells. In conclusion, this study is first report that investigated to identify biomarkers predictive of the response for RAD001 containing treatment in refractory GC patients, by comprehensive high-throughput genomic analysis (encounter assay). Responders for RAD001 containing treatment had overexpression of kinase genes such as EPHA2, PIM1, KSR1, and EIF2AK4 related to activation of motor pathway. This comprehensive genomic analysis for motor pathway is useful to evaluate biomarkers for RAD001 as well as to find a new novel molecule potentially involved in mTOR signalling. This work was supported by funding from the Korean Health Technology R&D Project, Ministry of Health & Welfare, Republic of Korea (HI14C2750, HI14C3418). Support was also provided by a grant from the Samsung Medical Center (SMX1161251). Corresponding author: Seung Tae Kim, M.D., Ph.D., Division of Hematology/Oncology, Department of Medicine, Samsung Medical Center, Sungkyunkwan University School of Medicine, 81 Irwon-ro, Gangnam-gu, Seoul 135-710, Korea. Tel: +82-2-3410-0297; Fax: +82-2-3410-1754; Email: shty1edu.